The ancient temple looks very casual from the outside, but once you step in the architecture tells you the actual story. The temple has 70 pillars with intricate carvings depicting stories of Vishnu and Shiva. Main shrine is dedicated to Shiva who is in the form of Linga made out of Green Onyx stone, hence the name Pachhala Someswara. There is huge beautifully carved Nandi who seems to come to life any moment. There is an archaeological museum on the site and many ruins around. The temple architecture is worth the visit. There are three famous and historic temples which are located in Panagal town. 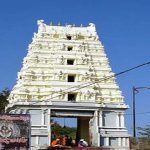 These are Pachala Someswara Swamy Temple, Lord Venkateswara Temple and Chaya Someswara Temple. Among these Pachala Someswara Temple is of great significance from architectural and sculptural point of view. Panagal is located nearly 4 km from the district headquarters of Nalgonda and is well accessible by road. The ground plan of Pachala Someswara temple is markedly different from other shrines in Telangana. It has four shrines and these shrines are arranged three on the western side while there is only one on the eastern side with a common and large rectangular mandapam. The historic temple represents the rich legacy of Panagal region in Nalgonda district with its finest sculptural works. This temple is located at the confluence of River Krishna and Musi (Muchikunda) at Wadapally village. Wadapally was earlier known as Wazeerabad. This is situated at a distance of 25 km from Miryalaguda and 70 Km from Nalgonda and 170 km from Hyderabad. The nearest Railway station is Vishnupuri (6km) between Bibinagar- Nadikudi Railway stations. 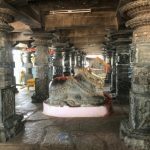 This is an ancient Siva Temple with a huge Siva Lingam of 6000 years old. The Lingam was installed by sage Agasthya. Siva and Maa Parvathi are worshipped here as Agastheeshwara and Meenakshi. 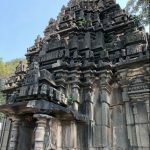 The Temple was built in 12 th century by Kakatiya rulers. It attracts large number of devotees in karteeka month and on Shivaratri days. For thousands of years the Temple remained in dense forest. Once a hunter was chaging a bird and the bird hid behind the Siva Linga to save its life. Lord Siva appeared before the hunter and asked him not to kill the bird and offered him to take his brain and the hunter inserted his fingures on the head of the Linga for the purpose and in the process the crevice was caused. The Temple opens at 6:30 am and closes by 7.30 pm. In between also closed for a few hours from noon. 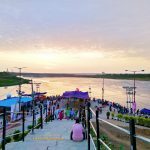 There are quite number of steps / slope to the Sangam where River Musi joins River Krishna. Private Boat facilities are available to take a ride in the Krishna river.